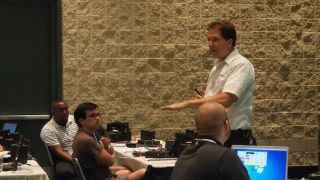 Pat Brown walks SynAudCon Sound Reinforcement For Technician attendees through the measurement process. Sound Reinforcement For Technicians is a 3-day, in-person training program offered by SynAudCon that puts learning in the hands of the attendees. "When working on sound systems, we need numbers," explained Pat Brown, SynAudCon owner and primary instructor. "Output level? Impedance of loudspeakers? System polarity? and more. This course is about learning how to take those measurements and how to interpret that data." Sound Reinforcement For Technicians features an innovative iPod controlled hardware interface that emulates the instruments needed to take sound system measurements. Via SynAudCon's signal distribution system, each attendee will be able to measure voltage, impedance, polarity, SPL and STIPA with the instrument. More importantly, they learn what these measurements mean, and how to use them to ensure that the system is performing optimally. The training seminar walks attendees through the process of troubleshooting a sound reinforcement system and covers a number of topics including system gain structure, grounding and shielding, amplifier selection and system tuning. Day three is the presentation of a the step-by-step loudspeaker equalization process. "Sound Reinforcement for Technicians puts meters in hands," said Pat. "You make the connections, you take the readings, you draw conclusions – that is what being a complete audio practitioner is all about." The next Sound Reinforcement For Technicians seminar will be held in Burbank, CA from October 28-30. The seminar is approved for 24 Renewal Units.